contributes to fulfilling the potential of the significant role evaluation can have in promoting social change. First discussing issues related to evaluation, social responsibility, social justice, and marginalized populations in general, it goes on to address issues concerning populations marginalized due to health, psychological, and physical difficulties; their cultural or ethnic/national status; or the specific geopolitical context of Israel. This is the 146th issue in the New Directions for Evaluation series from Jossey-Bass. It is an official publication of the American Evaluation Association. Barbara Rosenstein is a founding member and current chairperson of the Israeli Association for Program Evaluation. She was on the first board of the International Organization for Cooperation in Evaluation (IOCE), has taught evaluation theory and ethics, and currently conducts evaluations of social enterprise and social change programs. Helena Desivilya Syna is a social/organizational psychologist and the current chair of the MA program in organizational development and consulting at the Max Stern Yezreel Valley College. Her areas of expertise, research, and publications revolve around social relations and social issues, especially management of social conflict, building partnerships, and intergroup collaborations. Against a backdrop of Foucault’s theory of normalization, this article considers the following issues: how a theoretical framework for societal critique helps to understand social injustices, what characterizes the role of the evaluator, and how a different perspective on normal can further inclusion. The author writes this article in a conversational format between an evaluator and her colleague in which they unpack the ethical issues and social responsibilities of evaluation. 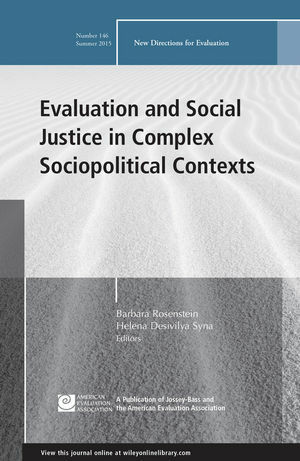 Drawing on field theory, these authors argue that the evaluation of social exclusion and social inclusion requires evaluators to reconsider their role and methods, as well as to revise the fundamental constructs through which they study interventions and change. The authors present the sociopolitical and socioeconomic context, the brave new job market, as a background for the evaluation—social justice interface. This article uses the concepts and methods of human rights to evaluate the programs of three Kenyan nongovernmental organizations that integrate legal and health services as a means to empower key populations. The authors illustrate how a joint effort between the evaluation team and the program developers promoted equal opportunities for Bedouin women teachers involved in the Partner Development Schools training program. Using the cases of two separate pre-academic preparatory programs, the authors conclude that evaluation could be conceptualized as a promoter of social justice. The article presents an internal evaluation unit as a democratic and culturally responsive mechanism that promotes social justice and generates new knowledge for the organization and its programs. Within an extremely challenging context, the author explains some of the political, logistical, methodological, and ethical challenges that evaluators in the occupied Palestinian territory have experienced in order to conduct well-informed and equity-focused evaluation work during the past 20 years since the establishment of the Palestinian National Authority (PNA). Based on a project in which Israeli and Palestinian teachers produced a textbook including the historical narratives of each group, this article highlights the significant contribution of the evaluator to the entire process.